Rhynotz utilizes the process of designing, building, and racing a variety of vehicles to share character-building stories and showcase the sport and hobby of racing. Rhynotz stories involve our readers in the complete process of conceptualizing, designing, and building vehicles and then racing or showcasing them. The Rhynotz characters learn and use the proper tools for each job and then race on variety of tracks and in many types of competitions, learning relatable, valuable lessons as they go. Rhynotz is seeking brand representation, licensing, and strategic global partnerships for the character-building children's series. The multimedia Rhynotz series is family friendly entertainment targeted to children ages 6-12. The series focuses on a pack of uniquely stylized, teenage rhinos who live to build and race the fastest rat-rod racing vehicles in a secret world known as "Koala Kanyon." Rhynotz combines fast-paced storylines, music, and imagery with character-building educational elements in each story. The Rhynotz stories place the characters in situations where they learn about acting with integrity, making positive and healthy lifestyle choices, and practicing problem-solving. The characters are fun, interesting, and relatable to kids who enjoy the stories and learn important lessons along the way. One of the most popular sports in America for decades, auto racing saw a surge in popularity in the early 2000's that continues today. Since the late 1990's, the market appeal of motorsports and auto-hobby related entertainment and media has spawned dozens of television shows, dedicated networks, movies, books, magazines, social media pages and channels, and merchandise. Motorsports fans and auto-mechanical hobby enthusiasts are people who love to share their knowledge of mechanics, racing, and all things auto-related. At car shows, races, or conventions it's common to hear "bench racing" or shop talk. "Gearheads," as we're often called, love passing down their knowledge to keep the love of racing alive in future generations. Rhynotz spans the generational gap, providing the older generations a touchstone to the youths in their lives. And while motorsports has traditionally been a male-oriented field, a progressive women's movement is on the rise in all forms of racing as well as the auto-mechanical hobby. Current and former popular racers include NASCAR's Danica Patrick, IMSA's Christina Nielsen, IRL's Sarah Fisher and Pippa Mann, NHRA's Force sisters (Ashley, Brittany, and Courtney), Leah Pritchett, Erica Enders-Stevens, Alexis DeJoria, Shirley Muldowney, and many others. Rhynotz children's series is for boys and girls and features female characters such as "Kandi Karbi." Rhynotz Children's Multimedia Series promotes the fantastic sport of racing with family friendly entertainment that highlights positive values and character role models for kids. We offer opportunities to promote you and your product or venue through our multi-faceted entertainment brand and media outlets. 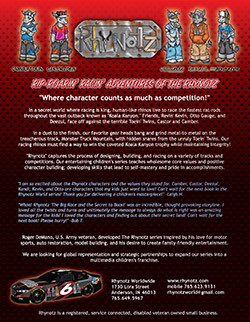 Rhynotz utilizes the process of designing, building, and racing a variety of vehicles to share character-building stories and showcase motorsports. Rhynotz involves readers in the complete process of conceptualizing, designing, and building the vehicles and then racing or showcasing them. Characters learn and use the proper tools for each job, showcasing specific, dedicated skills and then racing on a variety of tracks and competitions. More RACING, more STORIES, more ACTION, more MEDIA, and more OPPORTUNITIES! 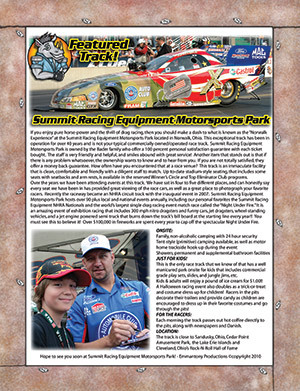 Within the current book, full-page promotional opportunities are available to racing-related organizations, venues, shows, and retailers! The series can be adapted into stories for more age groups! For example, a series for Toddlers (ages 3-5) will include stories and merchandising similar to what was done with Mickey and Minnie Mouse with the Disney Baby Characters. Another set for early adolescents (ages 13-14) brings in more advanced concepts and learning opportunities. Author/creator Roger DeMano has developed several concept scripts to continue the Rhynotz fun! Drag Pak Duels at the "Aussie Drag Way"
and plug-ins ... sub-stories teaching kids about on-site specific tool usage, build, and race techniques! Roles authority figures play in children’s lives, e.g., mom, dad, teachers, mentors, officers of the law, rescue workers (fire and safety personnel), etc. Importance of recycling and reuse, repurpose, reduce. Many stories take place in and around an abandoned military airfield and sanitary landfill. “Greening” your environment, such as vehicles in stories propelled by the character’s own power via mechanical means (pedaling, for instance). Animals in the stories are vegetarians, which also leads into any fuels used by internal combustion are propelled by fermented vegetable scraps/waste to make clean burning bio fuels, use of wind powered vehicles, and solar energies. Rhynotz and its associated characters are registered, copyrighted, and trademarked officially with the United States Patent and Trademark Office (USPTO). Rhynotz and its character names and web world are registered and secured through internet domains, including Ottogauge.com and Rhynotz.com. The Rhynotz logo names, character names, and worldwide names are prepared for global license and strategic partnerships. The Rhynotz series author/creator/producer Mr. Roger A. DeMano is exclusive holder of all patent, trademark, and copyrights to the Rhynotz Children's Multimedia Series and its unique characters, images, content, music, merchandise, toy concepts, educational content, and all other items and materials related to the series. Mr. Roger A. DeMano is passionate about motorsports, auto restoration, and car-building. He also has more than 20 years of experience working with youth in a variety of roles, including coaching, direct patient care, residential therapy, counseling, mentoring, and corrections. In creating the Rhynotz children's multimedia series, he combined his love of racing with his desire to help children grow into healthy adults, mentally, physically, and spiritually. 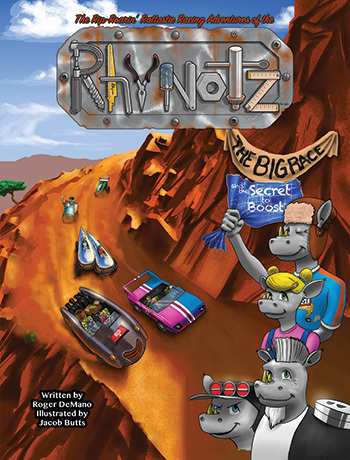 The Rhynotz characters and stories share important character-building lessons in a family friendly entertainment environment that also promotes racing, the sport and hobby that he loves. An honorably discharged, retired, service-connected, disabled U.S. Army Veteran, Mr. DeMano served on active duty during the first Gulf War era in combat support service, medical administration, and as an LPN. He also served as an LPN in the Indiana National Guard. He received his Bachelor of Science in Communications from Evangel University in Springfield, Missouri, with a double major in broadcasting and journalism and received an Associates of Science in Nursing/RN from Ivy Tech College in Indianapolis, Indiana. Mr. DeMano lives in Central Indiana with his wife and two children, who also enjoy racing and building race cars.